Port Canaveral cruise port is the second busiest cruise terminal in the world, after Miami. There are many reasons why Port Canaveral is such a popular cruise port and why 4.5 million cruise passengers choose it as the best cruise terminal for Caribbean and Transatlantic cruises. Before you book your next cruise, check out these top reasons why you should choose the Port Canaveral cruise terminal for your next luxury cruise. Port Canaveral has a central location on Florida’s east coast. It is situated midway between Titusville and Melbourne/Palm Bay and 45 miles east of Orlando. Port Canaveral is very easy to reach from northern U.S. states as well as Florida’s Panhandle, Jacksonville, Tampa, the Gulf Coast and South Florida. 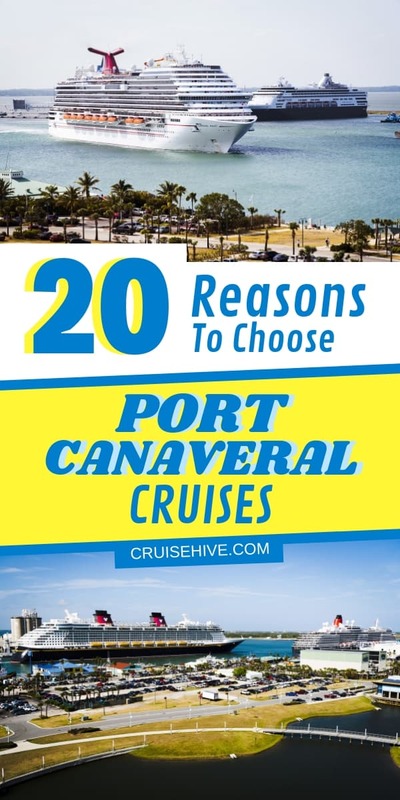 Port Canaveral is just 10 miles from the I-95 Interstate which runs south to Miami and north to Jacksonville, Georgia, the Carolinas, New York and the Canadian border. The east-west SR-528 Beachline Expressway (Toll) runs directly from Orlando to Port Canaveral and connects with the I-4 and the Florida Turnpike. These major roads make it very easy to drive to Port Canaveral either from Orlando Airport or anywhere north, south or west of the cruise port. International passengers have a good choice of airports within easy reach of Port Canaveral Cruise Port. Orlando International Airport (ORL) is 45 miles away. Cruisers can book a shuttle bus or car rental with cruise parking to transport them easily to Port Canaveral cruise terminal in around 45 minutes. Port Canaveral cruise terminals are modern and purpose-built to handle thousands of cruise passengers and their luggage safely and efficiently. So far over $237 million has been invested in the port infrastructure with more improvements still to come. Cruise Terminal 1 has recently been completely rebuilt and is used mainly by Royal Caribbean cruise ships. It was expanded to accommodate some of the newer and larger cruise ships including Royal Caribbean’s Majesty of the Seas and the 225,000-ton Oasis of the Seas which carries 5,400 passengers. Terminal 3 is currently being redeveloped. Due for completion in 2020, it is the port’s largest construction project ever. It includes dredging to accommodate larger cruise ships, onsite parking and a high-tech Customs and Border Control system to process passengers faster and more efficiently. These major cruise lines offer a variety of itineraries out of Port Canaveral including visiting the Bahamas, East and West Caribbean, Cuba, the Panama Canal and Transatlantic routes. Port Canaveral cruise terminal has some of the best amenities for viewing port activities as cargo ships, container ships, military vessels and cruise ships maneuver into and out of the port. Exploration Tower is a seven-story building with viewing platforms, galleries, hands-on activities and exhibits. Even if you’re not heading off on a cruise form Port Canaveral, you’ll enjoy this attraction at The Cove! Nearby Jetty Park is another great place for ship-spotting. There’s a sandy beach, fishing pier and café and a shoreside view of Port Canaveral cruise ships arriving and departing. Most people arriving for a Port Canaveral cruise are already in vacation mode. Why not book a few nights at a hotel in Cocoa Beach and extend your cruise with a few days of sun and sand. If you have a few hours, head to Jetty Park beach next to Port Canaveral cruise terminals. For longer stays, visit Cocoa Beach just a short 7-mile taxi ride from the port. Cocoa Beach is known for its gorgeous soft sand and rolling surf. With year-round sunshine you can work on your sun tan before or after your Port Canaveral cruise. While northern states are locked down with bad weather and heavy snowfall, Port Canaveral cruise terminal enjoys a balmy sub-tropical climate. Most cruises depart in winter when the Florida climate is dry and sunny – perfect for you sail-away cruise party as you wave goodbye to Port Canaveral cruise terminal. Port Canaveral has many excellent places to dine around the cruise terminals. Seafood is particularly popular along with pizzas, Italian restaurants, steakhouses and casual dining. Seafood Atlantic offers specialty dining and an upscale ambience at 520 Glen Cheek Drive. The menu focuses on locally caught seafood, crab cakes, shrimp and catch of the day. You can watch the cruise ships come and go in Port Canaveral cruise terminals while enjoying your meal. The restaurant also has a fish market if you want to buy fresh seafood to take home. Nearby, Grills Seafood Deck and Tiki Bar on Glen Cheek Drive serves world-famous shark kebobs among other tasty fish dishes. Try their grilled fish sandwich for lunch or treat yourself to meaty crab legs cooked to perfection. Located right on the waterfront at Sunrise Marina, this restaurant and bar will set the tone for your forthcoming Port Canaveral cruise! Also on the waterfront, Fishlips Bar and Grill is minutes away from Port Canaveral also on Glen Cheek Drive. Specializing in seafood, this award-winning restaurant does divine lobster bisque and clam chowder as well as fish and chips, pan-seared grouper, tuna, scallop risotto and more. If seafood is not your thing, try Kelsey’s Pizzeria and Restaurant on Astronaut Blvd in Cape Canaveral. It has an excellent reputation and goes beyond pizzas to offer a full Italian menu. Garlic bread, salads and antipasti can be followed with spaghetti, fettuccine alfredo, baked ziti and tortellini. Pizzas start at $9.99 and include optional gourmet toppings such as feta cheese, applewood bacon, sundried tomatoes and kalamata olives. As well as luxury cruises to Mediterranean ports of call, Port Canaveral is the home port of Victory Casino Cruises. They sail from the port twice daily, at 11 a.m. and again at 7 p.m., and cruises last 5-6 hours. You must be 18 years or older to sail and gamble, and over 21 to drink alcoholic drinks. Casino cruises cost just $13 to board and guests can pay an additional fee for buffet dining. Once the ship reaches international waters, land laws regarding gambling no longer apply. Victory Casino Cruises open their casino once they are three miles offshore. Like larger cruise ships, casino cruises have many slots and tables for black jack, baccarat, poker and Texas hold’em among other popular card games. Unlike the busy area around the Port of Miami or Fort Lauderdale, Port Canaveral cruise terminal has plenty of space for cruise parking close to the cruise terminals. It even has cruise parking onsite. Check out the best cruise parking at Port Canaveral cruise port now! If you’re cruising out of Port Canaveral cruise terminal, you are just 13 miles from Kennedy Space Centre. It could be the chance of a lifetime to see the space shuttle Atlantis, tour the Visitor Centre, launching pads and experience simulator shuttle launch rides. You can even have lunch with an astronaut and ask all your questions about space travel. Check the Kennedy Space Center events calendar and time your Port Canaveral cruise to coincide with a rocket launch. You don’t have to be at Kennedy Space Center to see it (although viewing it from the special Observation Gantry or NASDA Causeway is pretty exciting!). Jetty Park at Port Canaveral and Cocoa Beach both offer great opportunities to see the rockets as they climb high into the sky with a fiery tail. Canaveral National Seashore State Park is also a great place to see a rocket launch up-close. Port Canaveral has plenty of accommodation for cruisers from budget motels to luxury hotels. Check out our article to find the best places to stay in Port Canaveral before or after your Port Canaveral cruise. We also have a comprehensive guide to hotels near Port Canaveral with cruise shuttle. If you’re spending a few days in the Port Canaveral area, you’ll need a car rental for getting around. The beautiful beaches at Cocoa, Kennedy Space Center or perhaps at trip to Orlando’s shopping malls and theme parks will all be easier if you have a car rental. Find the best deals by reading our guide to Port Canaveral car rentals. No other cruise port has so many unique attractions and activities on its doorstep. Port Canaveral has a wide choice of activities for visitors to enjoy before or after their cruise. Head to the beach for sunbathing, boogie boarding and beach volleyball. Go fishing from the shore, Jetty Park pier or book a half day fishing charter. You can also play golf, crazy golf or rent bicycles and explore nearby trails. Make time to visit Florida Tech Botanical Gardens and Sebastian Inlet State Park with its interesting McLarty Treasure Museum on the site of a shipwreck survivors’ camp in 1715. Take a boat trip along the Intracoastal Waterway to see manatees, dolphins and wading birds that live in this beautiful area. Visit Canaveral National Seashore to experience the wilder side of Florida including nesting sea turtles in the summer. If you want the exhilarating experience of speeding across water in a noisy airboat, book yourself a one hour tour with Airboat Rides at Midway. The marina is just 30 minutes’ drive from Port Canaveral cruise terminals at the small community of Christmas on SR-50. Airboat eco tours explore the flowing waters of the St Johns River which are rich in bird and wildlife. Keep your eyes open and you may see alligators basking in the sun on the riverbank and swimming through the water with just their eyes and snout above water. Port Canaveral is just 45 minutes’ drive from Orlando, home of Mickey Mouse, Sea World, Discovery Cove, Disney’s Hollywood Studios, Epcot and the Wizarding World of Harry Potter. Combine your Port Canaveral cruise with a few days in Orlando for the vacation of a lifetime. Your Port Canaveral cruise ship may have a Flow Rider surf simulator on-board so you might want to get in some practice ahead of time with some real surf lessons. The best place to find surfing gear and tuition is at the world-famous Ron Jon Surf Shop on Cocoa Beach. Book a place with an experienced instructor at the Ron Jon Surf School and they’ll take you from beginner to better in no time at all. You might want to linger in the store and pick up some cruise surfer gear and souvenirs too. Ron Jon Surf Shop is just 4 miles south of Port Canaveral cruise terminal on N. Atlantic Ave (A1A). Now you can see why Port Canaveral cruise terminal is the best choice for cruises!